Part 1 introduced three of the earliest tile sets. George B. Glover most probably collected two in the period 1872 – 1873. One has documentation dated 1875. Carl Himly acquired a third very similar tile set, most probably during the period 1868 – 1876. In this paper I present documentation, again both material and archival, on which Culin and Wilkinson based their original papers. These allow us to critically evaluate their observations and draw our own conclusions about the development of the game. Also presented is a newly discovered very early twentieth century tile set with documentation, which also substantially enhances the development history of the game. 3. 3. 1 Acquisition and Accession History. The Sinologist W H Wilkinson, who was Davis Chinese Scholar at Oxford, 1879, and a member of the British Consular Service in China from 1880 to 1918, acquired, according to his literature, at least three tile sets. Wilkinson used the word “Dominoes” for tiles or tablets and applied the term chung fa or chungfa (in pinyin zhong fa1), which he defined as “Hit and Go”, to a particular game-play (see Part 1). Further, he observed that the game of chungfa was, in 1889, confined to the provinces of Chekiang (now Zhejiang) and Kiangsu (now Jiangsu) (Wilkinson 1895). However, Wilkinson also noted that the term ma chioh (ma que), meaning “hempen birds”, was also in existence in central China 1889 but was used as the name of a class of three suited money cards2. The first set was sent as part of a collection of games to Lady Charlotte Schreiber who subsequently bequeathed that collection, as part of a larger collection, to the British Museum (BM). Wilkinson wrote a cover note or description of his entire collection and this became part of the Catalogue of the Collection of Playing Cards (1901) of the Schreiber Collection. The cover note, dated 1890, states that all the games were collected in the year 1889 – 90 (this is also confirmed in his unpublished paper titled Mah-Jongg: A Memorandum (1925)) and this set in particular, #26, was acquired in Ningpo (Pinyin Ningbo) and was “in tablet (domino) form, bone and blackwood” (Wilkinson, 1890). It has the BM catalogue #1896,0501.904.a-ej and its accompanying wooden box has the BM catalogue # 1896,0501.904.ek. Both are permanently located in the BM department of Oriental Antiquities, Stein Room, drawer 25. However, in his 1925 Memorandum under the general heading “Extracts from my unpublished notes. (a) From a MS. written by me in 1890,” Wilkinson states, with reference to ‘chung fa’, “my specimens of the former came from Shanghai and Ningpo; they are of bone and ebony and bone and bamboo.” Assuming this part of the extract is a direct transcript of his 1890 manuscript notes, it is therefore unequivocal evidence that he had collected two sets in 1889 and that chung fa was available in both Shanghai and Ningbo, with the Ningbo set going eventually into the Schreiber collection in the British Museum. Assuming it exists, its location remains undetermined. The third set was part of a collection of games given to Stewart Culin for exhibition in the section of Games at the Columbian Exposition, Chicago, 1893 and was described in a catalogue prepared by Wilkinson which appeared as part of the Descriptive Catalogue, World’s Columbian Exhibition, Department M. Revised Edition, p. 84, Chicago 1893 (Culin 1895). Wilkinson’s catalogue was subsequently reprinted in Culin’s Games of the Orient (1895). Wilkinson (1925) states that the set was collected in 1892, and from his 1893 catalogue description the set, #43, was acquired in Ningbo. After the Columbian Exposition, Wilkinson donated it to the Museum of the University of Pennsylvania. However, my enquiries have failed to locate it there. 3. 3. 2 The British Museum Tile Set and Box. Figure 3. The British Museum (BM) Tile Set. The BM tile set consists of 140 pieces. Each piece is composed of bone with a concave top and bottom surface joined with a transverse dovetail joint to a similarly surfaced ebony base. Their dimensions are: Length 23mm. Width 19mm. Height 10mm. The tile set is contained within a small, square shaped wooden box with a sliding lid, both of which have stamped and painted sinograms. With the assistance of John Berry, Wei-Hwa Huang and Thierry Depaulis I have managed to obtain the most likely meanings of the stamps and writing on the box. On one side of the box and similarly on the lid, from right to left, are three vertical, black, rectangular stamps each containing two sinograms in a column. There are three additional, but very faded, painted sinograms in a column, and due to their lack of clarity I am unable to determine their meaning with any confidence. From a comparison of figure 3 with figures 1 and 2 (see Part 1), it is apparent this set shares with the Glover sets certain tile groups, colouration and style of engravings (although the ‘strings of cash suit’ is represented by pointed strings of cash rather than ‘bars’ or ‘rods’). The colours blue, green and red are used systematically throughout, with minor variations. There are three money suits, four of the five ‘points of the compass’ or ‘Directions’ and the ‘Blank’ tiles – four of which are used in play in the Wilkinson set (Wilkinson 1901, 1925). However, in the Glover cover note the sinogram 中 chung (pinyin zhong), is defined as a noun, meaning ‘centre’ or ‘middle’– and is identified by him as the fifth Point of the Compass, or Direction, whereas in Wilkinson’s set the same sinogram chung (zhong) is defined as a verb by Wilkinson, meaning ‘to hit’; ‘to hit the centre’ or, according to Millington (1998), ‘to be successful’– and is therefore a separate group from the Directions. To the four tiles with the sinogram 發 fa, Wilkinson assigned the meaning “go”. With the four blank tiles, called 白 bai, we have the quadruplicated triad group usually called, in the West, the White, Green and Red ‘Dragons’, namely, bai, fa and zhong, respectively. From the description of the game-play from Wilkinson’s manuscripts notes of 1890 (see Pt. 1), it seems these three groups formed a stable quadruplicated triad as early as 1889. The absence of the two quartets such as the ‘Flowers’ and the ‘Seasons’ groups for example, the presence of all the other groups found in the Mahjong(g) tile set, clearly establishes this as a precursor tile set. 3. 3. 3 The ‘Columbian Exposition’ Set. As I noted, my initial enquiries failed discover the location of this set in the Museum of the University of Pennysylvania, although it is described in Culin (1893), Wilkinson (1895) and Culin (1924). However, there is an apparent discrepancy between Culin’s 1893 and 1924 descriptions. The former has the omission of the 4 chung (zhong) tablets although in that description the game is given the name chung fa (zhong fa) by Wilkinson and therefore one could justifiably infer that it had the chung (zhong) tablets as well as the fa tablets and therefore conclude the two descriptions are most likely describing the same set. According to Wilkinson’s 1893 catalogue description,the set was put up in “tablets of bone with bamboo backs”, rather than the bone and ebony of the BM tile set, and the composition of the groups is identical to the BM set as are the colours used to pigment the engravings, although the style of the engravings and the shape of the tiles are unknown. If this set is identical then it too can be labelled as a precursor tile set. 3. 4 The Laufer Set. 3. 4. 1 Acquisition and Accession History. Berthold Laufer, who led the Jacob H. Schiff expedition to China between 1901 and 1904 for the American Museum of Natural History (AMNH), also acquired a tile set. From studying the original AMNH catalogue I was able to discover that Laufer numbered the tile set # 311. This was changed by the AMNH to acquisition # 4856, and then catalogue # 70/4856. The tile set is labelled as ‘dominoes’. Further, from studying his assiduous expedition correspondence, written in English (some correspondence is written in German), particularly letters AMNH # 19, AMNH # 20 and AMNH # 21, it is clear he had acquired the set in Shanghai before September 27th 1901. 3. 4. 2 The Tile Set [Figure 4] and Box. Figure 4a. The American Museum of Natural History (AMNH) Tile Set. Figure 4b. Side view of various tiles from the AMNH set. This AMNH set (see Figure 4a) consists of 140 pieces. Each piece is composed of bone joined with a transverse dovetail joint to an ebony base (see Figure 4b). Their dimensions are: Length 24mm. Width 20mm. Height 11mm. The tile set comes with a small wooden box with a sliding top lid. However, I think it is now very probable there may have been a switch with a similar box with the catalogue number 70/4855. This particular box carries a label that has a stamp containing two horizontal rows, each with three white-on-black sinograms, to be read right to left. Translation: the most likely translation is of a company name3. Translation: Either a product name or trademark called ‘sparrow name’ or ‘sparrow’4. Beneath the stamp are two columns each containing three sinograms painted in black. The third sinogram in each column remains undetermined. The sinograms clearly indicate this box (70/4855) has been incorrectly catalogued and should belong with the Laufer tile set (# 70/4856). (This has been brought to the Museum’s attention and will be rectified in due course). From a comparison with figure 3 and considering the twelve-year interval, this tile set is remarkably similar in most respects to the Wilkinson set (excluding a few differences in the use of the colour pigments). Again the high degree of similarity in composition to the circa 1920 Mahjong(g) tile set (as in Babcock 1920) and the lack of the two quartets, such as the ‘Flowers’ and ‘Seasons’ for example, establishes this tile set as a precursor. 3. 5 The Culin Tile Set. 3. 5. 1 Acquisition and Accession History. Stewart Culin purchased sets of bone and bamboo dominoes for the Brooklyn Museum’s (now the Brooklyn Museum of Art (BMA)) Chinese Hall when he visited Shanghai in December 1909 (Culin, 1924). One of these sets of ‘dominoes’ had engravings identical to those found on the later tile sets associated with the game of Mahjong(g). A representative sample of the tile groups of the set (for some reason the blank tiles are absent) is pictured in his 1924 paper with the caption “Brooklyn Museum Collection Purchased in Shanghai, China, December 1909”. Culin’s Shanghai informant explained these ‘Dominoes’ were starting to be used, by all the classes of Shanghai society, for two games – in Cantonese, wak fa5, “To Draw Flowers” and cho ma-cho6 – which Culin transliterates into the Cantonese ma-tseuk, meaning ‘sparrow’. The name ‘sparrow’ would appear to be consistent with the name ‘sparrow’ on the Laufer box and may indicate that this latter term referred to a game-play as well. If it is assumed this was the case, when taken together the Laufer and Culin data suggest that ‘Sparrow’ may have been used to denote the tile set and the game-play as early as 19017. There is no documentation accompanying this BMA tile set [Figure 5.]. To ascertain its pedigree one must do a comparative analysis with the sample group of tiles, clearly pictured in the original 1924 paper, and the tile set in figure 5. From this analysis there are many points that, in my view, identify both sets being one and the same. The style of the engravings and the type of symbols on the pieces and their arrangements are identical – as in the number 1 Cash, the 1 String of Cash. There are two characteristic blotches on the 7 of Cash and 7 of Strings of Cash and these are also found on the same numbered tiles in the BMA tile set. Most importantly, the numbers and positions of each of the engravings or cuts that make up each unique pictorial symbol on each tile of the two quartets are identical in every respect. The tile set, figure 5, has the BMA catalogue # 09.943. 3. 5. 2 The Tile Set [Figure 5]. Figure 5. The Brooklyn Museum of Art (BMA) Tile Set. This Culin/BMA tile set consists of 144 pieces. Each piece is composed of bone (or possibly ivory) joined with a transverse dovetail joint to a bamboo base. Their dimensions are: Length 26mm. Width 20mm. Height 13mm. The tile set is now contained within two square cardboard boxes. There are two discrepancies between figure 5 and the set in Culin’s 1924 paper. The first is the omission of the four blank tiles from the image in the paper and the second is the presence of three larger tiles labelled “civil” (文 wen), “military” (武 wu) and ‘controller’ (which has the sinogram 摠 zong, seen on the zong wang tile of the Himly set) in the same image, but missing from figure 5. The omission of the blanks can be accounted for if one assumes Culin was unaware that they may have been part of the ‘Honours’ triad and not just spares. The three extra tiles on closer examination are obviously considerably wider than the rest of the set and so would be useless in play. It is possible they may be from some other game set or were added to this tile set at the time of purchase. The tile set in figure 5 consists of the three money-derived suits, the ‘Directions’, the ‘Honours’ and two quartets. In this case, the conventional grouping of the ‘Four Noble Plants’ – plum-blossom, orchid, bamboo and chrysanthemum – represent the ‘Flowers’ while the ‘Seasons’ have been replaced by the representations of the ‘Fours Arts’ of the Scholar (who is one of the ‘Four Callings’), symbolised by the chessboard, the lute, the book and the painting (utensils)(Eberhard, 2003). The composition of this tile set and the name ‘sparrow’ (perhaps with its double sinogram) associated with it, are remarkably similar to the structure of the tile set and the standard double sinogram (má qué meaning ‘sparrow’), respectively, that were associated with the term ‘Mahjong(g)’ by Babcock. Further, the ornately engraved 1 Cash, a bird on the 1 String of Cash, the ‘bars’ or ‘rod’s to represent Strings of Cash and the way the colour pigments of red, green and blue have been used are, when taken together, a convention that became predominant in the standard sets post circa 1919. Pinyin romanisation of Chinese is used throughout. Where other romanisations are used the pinyin form is in parentheses. My comments are in square parentheses. This may also be a reflection of the game’s position in society, ie; ‘popular’. This may be similar to Wilkinson’s (1925) 1890 term 什胡 shi hu, which denotes a generic term for a kind of cards where there are four of each kind of card. Thierry Depaulis notes; in Cantonese waak6 faa1 and in Mandarin 劃花 hua4 hua1, meaning to “design”, that is, to “combine flowers”. When juxtaposed with ma que (see below), this may suggest a ‘non-gambling’ form of the “sparrow” game. The game-play may also have been in existence in the North of China in 1909. While at an Inn at Port Arthur, near what is now called Dalian, the noted Japanese author Natsume Soseki witnessed four Soy suppliers playing a game in which each had approximately fifteen tiles, with various designs on them, made of ivory joined to a bamboo base. They employed the draw and discard method and “the player who collected the largest number of pieces with the same design was the winner”. (Soseki, 2000). One could have been forgiven for holding the view that the earliest known date for the appearance of a game-play, a tile set and the name ‘sparrow’ with its accompanying double sinogram, that became associated with the game known as Mahjong(g), was circa 1890 in China. In the light of part 1 of this paper we now know this date should be modified to the period 1872 – 1873 for the tile set, located in both Fouzhou and Ningbo, and to at least 1875 for the name ‘sparrow’ and one sinogram associated with it. From the documentation presented no date of an origin can be proffered, only the earliest date so far determined for the development history of these aspects of the game. In the light of the Wilkinson and Laufer data in part 2, it is tentatively proposed that the tile set may have become standardised between 1890 and 1901 around the area of Ningbo and Shanghai and this may also have been the case for the game-play as well, in view of the remarkable similarities in the descriptions on the labels on the boxes of their tile sets. However, data from all the documentation so far uncovered suggests that, for the most part, the tile set as an instrument of play remained fairly stable in overall group and tile numbers between circa 1872/73 and circa 1920, although it is clear that the composition of some of the groups did vary. By 1909 we know that the conventional form of the tile set already was beginning to make its appearance in Shanghai at least, and the game also may have been played as far north as Port Arthur/Dalian at this time. Special thanks to John Berry, Thierry Depaulis, Wei-Hwa Huang and Laurent Long for their kind assistance with the text and the translations. Thanks again to Thierry Depaulis for the suggestion of the title. I would also like to thank Laurel Kendall, Barry Landua and Kristen Mable of the AMNH; I-Hsuan Chen, Ruth Janson, Amy Poster and Deborah Wythe of the BMA; Cynthia Sanford of the Brooklyn Historical Society; Dr. Colin MacKenzie of the Asia Society, New York; Dr. Irving Finkle and Steven Ruthgo of the BM. Many thanks to Tom Sloper for his financial assistance and suggestions. Babcock, Joseph P. Rules for Mah-Jongg. n.p. San Francisco : W.A. Hammond Co., 1920. 12 p. (Sloper Coll.) ; reprints 1921, 1922,etc. Culin, Stewart. ‘Dominoes from Fuhchau’ under ‘Chinese Games with Dice and Dominoes’. In: Annual Report of the Board of Regents of the Smithsonian Institution for the year ending June 30, 1893 (Report of the US National Museum), Washington 1895, p. 491-537(reprint : Seattle, Wash. : Shorey Books, 1972). Culin, Stewart. ‘The Game of Ma-Jong, its Origin and Significance’. In: Brooklyn Museum Quarterly, vol. XI, 1924, pp. 153-168. Dummett, Michael. 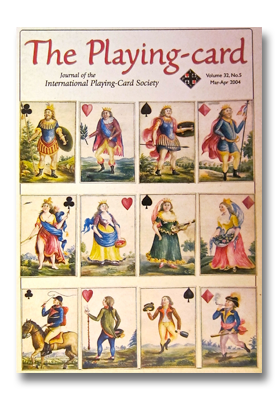 ‘A Vietnamese Card Game’. In: Ludica, 2, 1996, pp. 255-261. Eberhard, Wolfram. A Dictionary of Chinese Symbols. Hidden Symbols in Chinese Life and Thought, Routledge, 2003. (1st ed. 1973). Soseki, Natsume. ‘Travels in Manchuria and Korea’. In: Rediscovering Natsume Soseki, with the first English Translation of ‘Travels in Manchuria and Korea’, Global Oriental, 2000. Wilkinson, William H. (1890): Published in 1901 as pp 184-194 of Catalogue of the Collection of Playing Cards Bequeathed to the Trustees of the British Museum, F. M. O’Donoghue. Wilkinson, William H. ‘Chinese Origin of Playing Cards’, in The American Anthropologist, Volume VIII, 1895, pp. 61-78. Xu, Ke. ed., Qing bai leichao (“Qing Unofficial Categorized Extracts”, or “Classified Anecdotes of the Qing Dynasty”), Shanghai : Commercial press, 1917, 7 vols. (reprint Taipei, 1966, 12 vols. ; Peking, 1984). The extracts used in this paper were translated into French by Laurent Long and then into English by Thierry Depaulis. MAJAN HAKUBUTSUKAN DAIZUROKU (“Illustrated Book of the Mah-Jongg Museum,” or literally translated “Mah-Jongg Museum Big Encyclopedia”). Edited by the Mah-Jongg Museum (no author name). Publisher: Takeshobo, April 1999.